Evalon is suitable for both new build and refurbishment projects and can be fully bonded, mechanically fastened or loose laid and ballasted. 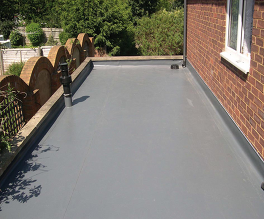 Evalon membranes are particularly suitable for overlaying existing flat or pitched with the minimum of disruption to existing users. Existing features, designed into the roof can be faithfully reproduced to retain the initial architectural concept within a highly competitive package. Evalon has been extensively used in commercial applications, with over 100 million square metres of Evalon Membrane currently in service in some of the harshest climates on earth, from Norway to Saudi Arabia, with no recorded cases of failure whatsoever. Evalon is independently certified by the British Board Of Agreement to ‘provide a durable service life of at least 30 years’ (see below), requires no maintenance, is not at risk from thieves, and will provide a lifetime of protection against anything the British climate can throw at it!